Apart from Alan Bold’s life of MacDiarmid, which appeared almost twenty years ago, and the study of George MacKay Brown by Maggie Fergusson, published last year, very few modern Scottish poets are the subject of full-scale biographies. The reasons for this are not entirely clear, but David Robb’s Auld Campaigner, a Life of Alexander Scott comes as an excellent fillip. It is both a revealing and sympathetic study of the man and a major addition to the body of work about the second wave of the Scottish Literary Renaissance. 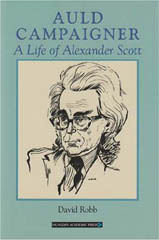 Not an ‘official biography’; that is, not ‘a telling of the story dictated by how the family would want the world to have it’, Robb’s book is based partly on Scott’s important archive of papers, now in the National Library of Scotland, and partly on a considerable number of interviews with family, friends, colleagues, fellow poets and students who knew, worked with, and on occasions crossed claymores with the man. More than just an ‘Auld Campaigner’, who, as a young WWII soldier, won the Military Cross ‘for gallant and distinguished services in action’, Scott was also a ‘bonny fechter’ in the cultural and academic arenas. Robb’s book is also a fascinating survey of academic and cultural politics in Scotland from the post-war period to the 1970s and 80s. Instead of high idealism in the groves of academe he exposes political machinations – ‘nature red in tooth and claw’. Robb also discusses in depth the more entertaining and no less serious conflicts – literary, ideological and personal – of the world of poetry, with its huge egos and artistic (and occasionally alcoholic) temperaments and great fallings-out. Following his distinguished war service, Scott resumed his studies in English Literature in Aberdeen, and took up his first teaching post in 1947 as an assistant lecturer at Edinburgh, before being offered a full lectureship in the newly introduced subject of Scottish literature at Glasgow the following year. On hearing of his defection west, his disappointed Edinburgh professor told Scott that, could he but wait, a full lectureship in Scottish literature at Edinburgh would be his. However, Scott went to Glasgow. Had he not, who knows what the fate of Scottish literature in Scottish universities would have been, and might Edinburgh have been the first in the world to create a lectureship, then a department, then a chair in Scottish Literature? But such speculation is idle, given the low opinion in which Scottish Literature was held by some at Edinburgh. Scottish Literature was a completely new academic subject, and there was little teaching material of any significance available for Scott to fall back on, in effect practically none. Robb reminds us that, at the time, ‘too many important Scottish authors lacked modern editions, and too many leading Scottish writers had yet to be the focus of a body of modern criticism,’ and adds that Scott had to devise the course and write all lectures entirely from scratch. Thus for him, this appointment carried with it not only an enormous workload, but it also represented a huge responsibility. Scott’s appointment as Glasgow University’s first lecturer in Scottish literature and his creation in 1971 of the world’s first – and only – Department of Scottish Literature were impressive enough achievements, and not his only ones. Poet, broadcaster, dramatist, polemicist, agitator and activist, represent the other strings to his lyre, or perhaps to his bow, and these Robb fully discusses alongside Scott’s commitment to Scottish literature. Scott’s poetry has always deserved to be more widely known, and this would be a good time for a revaluation of his literary work, including a revival of his plays. Posterity does however acknowledge Scott’s life’s work and his achievements in this very fine biography, which Robb modestly hopes is ‘an attempt to encourage present and future readers to engage with’ Scott. This, I think, David Robb’s Auld Campaigner will achieve, and more. In faithful tribute to what Alexander Scott did himself in the course of his adult life, Robb’s book, as another Scottish poet was wont to say, is sure to stir the buggers up! It also deserves to be considered for one of our growing number of national book awards.